Danya and I were recently invited to host a TV show that is going to be filmed in Tel Aviv, highlighting the city’s culinary landscape. Once they reached out to us we were obviously really excited, but then we realized we would have to pass an audition. The audition required us to answer all sorts of questions, mostly food related, and answer them on camera. We filled out our questionnaires separately, both of us in the comfort of our own home, at night, when are are finally able to sit down to..work. When we got together to video ourselves we realized we had nearly identical answers for one of the questions: What would be your last meal. Danya answered: Something with Dough. I answered: Anything that consists of water, flour, salt and yeast. In other words:dough. We weren’t surprised. Both of us could live on carbs. We usually don’t go to the PR events we are invited to as bloggers (not because were snobs- but because were mothers). But when we were invited by Yair Feinberg and Eli Hoffman, the guys behind Feincook to come to their studio for Pizza night, we obviously couldn’t say no. Feincook is the brainchild of those two aforementioned men and is a studio of culinary ingenuity. They develop recipes, import and manufacture advanced kitchen tools (like the Thermomix and Sous-Vide), and they hold classes on all sorts of food related topics. Recently Feincook has developed and produced a newer/better version of the baking stone for the home kitchen called the Fast and Crust. It’s lightweight and easy to clean and makes all baked goods in the oven crispier and reduces baking times. Right now its available only in Israel. If you don’t have one, you can use the traditional baking stone, or simple bake regularly in the oven. So back to pizza night. Not only was it a really fun experience to finally get out and meet other food bloggers, but the pizza was crisp and delicious. So we talked to Yair and Eli about doing a guest post for us and they gladly accepted. 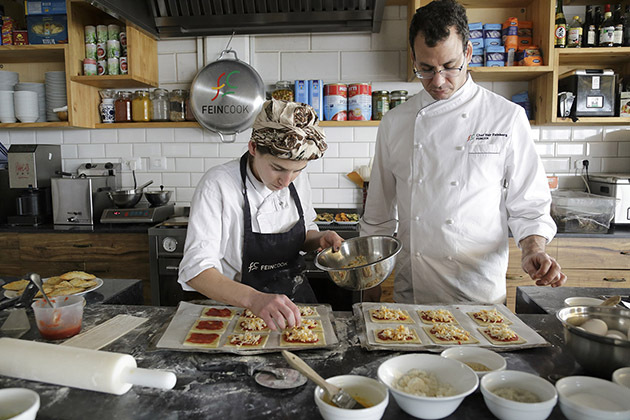 Place the Fast and Crust in the tray in the middle of the oven and set oven temperature to 200C/400F. Line a baking sheet with parchment paper. 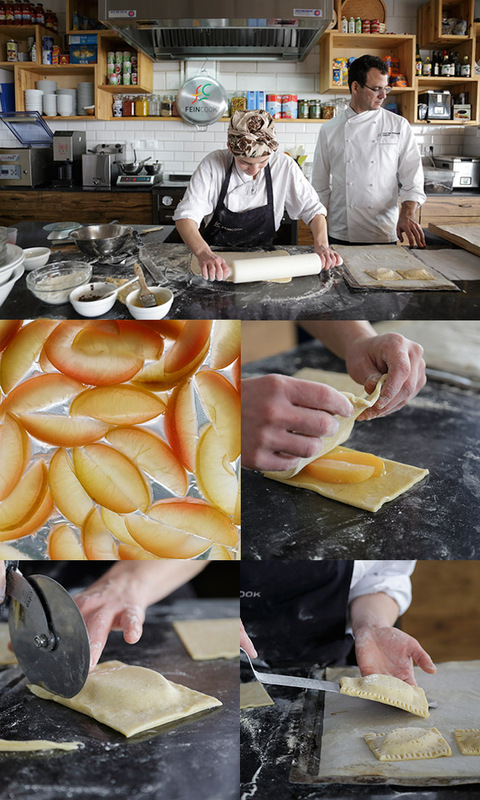 Working on a lightly floured surface, roll out the puff pastry dough to about a ½ cm. thick. Using a pizza cutter or a sharp knife, cut the dough into 10 cm./4 in. squares and place them on the prepared baking sheet. 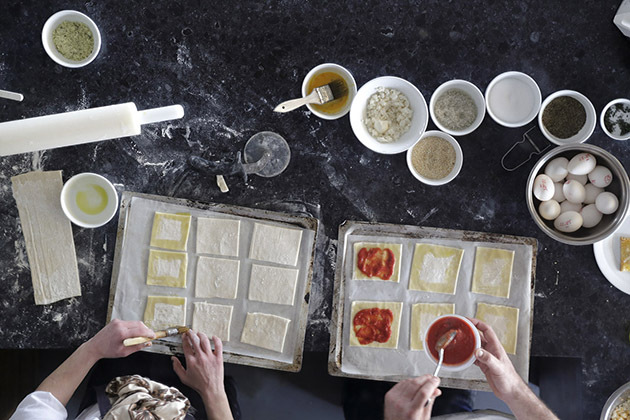 Brush the edges of each square with olive oil. 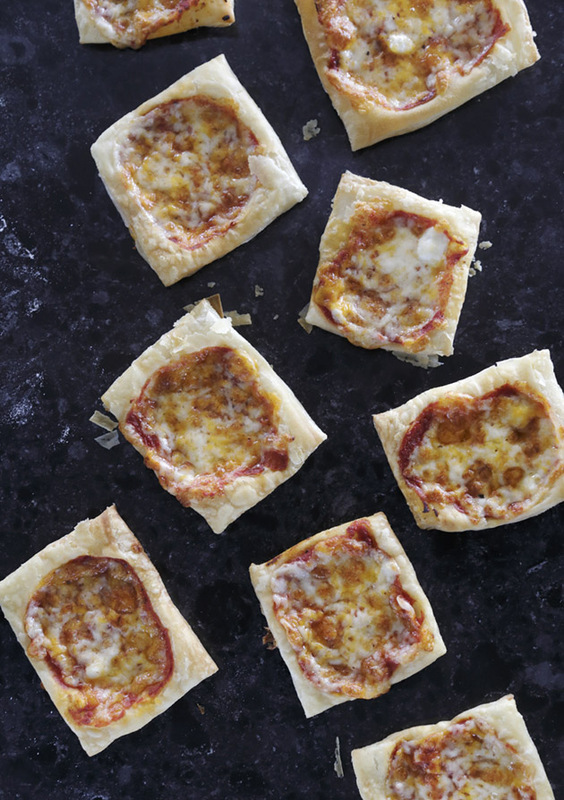 Place a tablespoon of tomato sauce onto the center of each square and use the back of a spoon to spread it out evenly. Sprinkle the cheese on top of the sauce. Slide the baking paper onto the Fast and Crust and bake for 10 minutes. Remove from oven and serve warm. Mushrooms, olives, artichoke hearts and anchovies would make for great toppings. You can also add some fresh, torn basil leaves right after the pizza comes out of the oven. Using a food processor, mix together the flour, sugar, salt, cinnamon and butter until combined. Add the egg yolks and continue mixing for another minute, until dough is formed. Remove dough from food processor and divide into three parts. Cover each ball of dough in plastic wrap and refrigerate for at least one hour. Place the water, white wine, sugar and clove in a small saucepan and bring to a boil. Reduce heat and add the apples. Continue to cook for 10 minutes. Remove from heat and refrigerate until using. 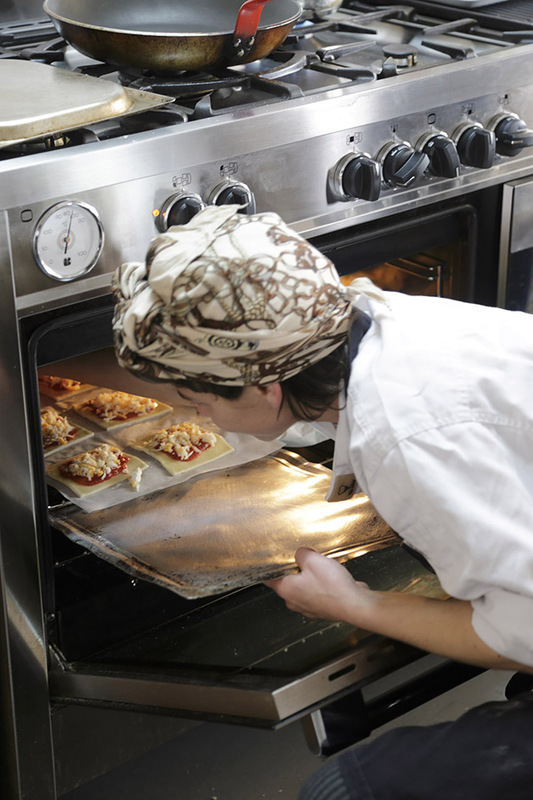 Place the Fast and Crust in the tray in the middle of the oven and set oven temperature to 180C/350F. Line a baking sheet with parchment paper. Working on a lightly floured surface, remove the dough from the fridge and roll each ball out to a 30cm./24 cm. (12in.x10in.) rectangle. 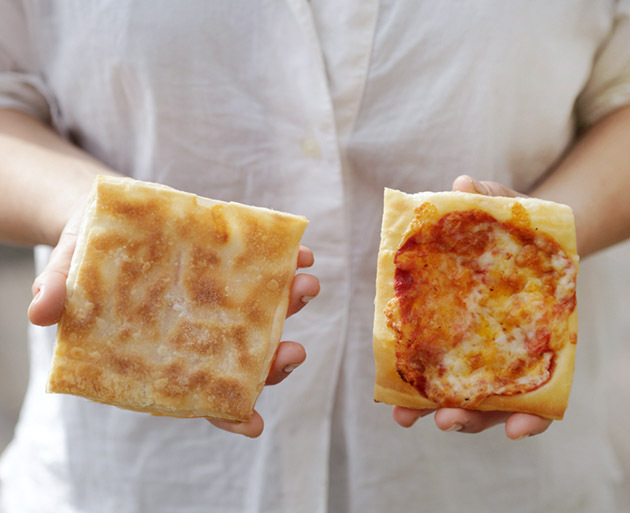 Using a sharp knife or a pizza slicer, cut the dough into 10cm.x8cm. (4in.x3in.) rectangles. Place half onto the prepared baking sheet. Strain the apples from the liquid and place 2-3 slices in the center of each rectangle. 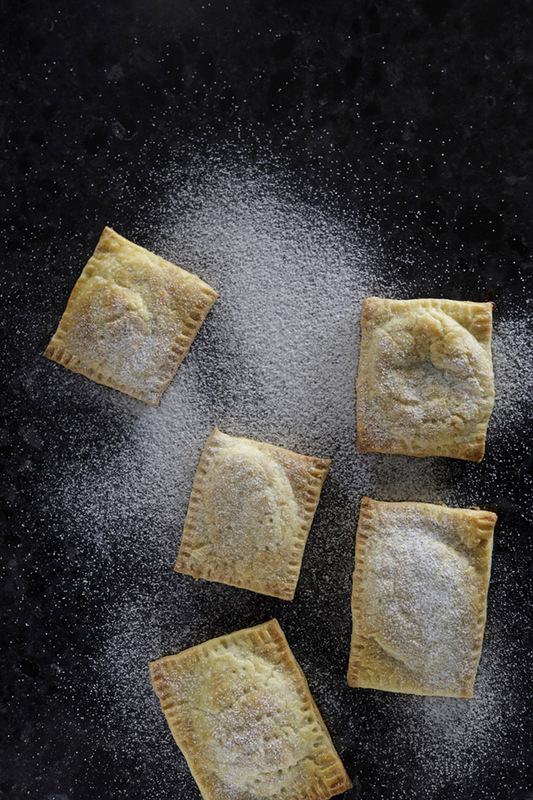 Cover the rectangles with the remaining dough and use a fork to pinch the edges so that they are sealed closed. Brush each rectangle with the egg and sprinkle a bit of sugar on top. Using a fork, poke about 4-5 holes into the dough. Slide the baking paper onto the Fast and Crust and bake for 10-12 minutes. Remove from oven and serve warm or at room temperature. You can replace the apples with poached pears or chocolate spread or Nutella, or any other spread you can think of. You can freeze these pre-bake and defrost about an hour before baking. I LOVE puff pastry and making home made pop tarts! (I made pop tart hamantaschen for Purim: http://www.kosherinthekitch.com/pop-tart-hamantaschen/ ) The mini pizza looks delicious!